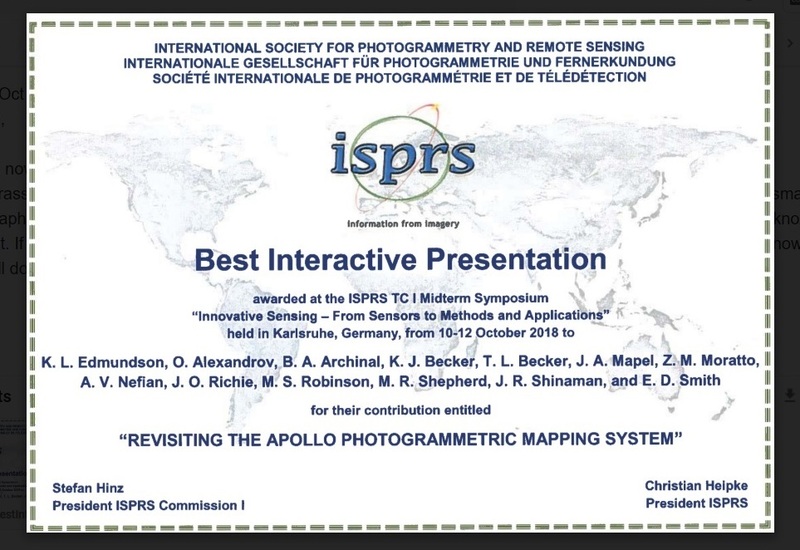 Researchers from USGS Astrogeology, along with colleagues from NASA Ames Research Center and Arizona State University (ASU) were recently awarded Best Interactive Presentation at the International Society of Photogrammetry and Remote Sensing (ISPRS) symposium held at the Karlsruhe Institute of Technology, in Germany, from 10-12 October 2018. This award was presented for the contribution entitled “Revisiting the Apollo Photogrammetric Mapping System.” This mapping system was a group of cameras on the last three Apollo lunar missions (15, 16, and 17) in the early 1970s, used to take high-quality pictures of a significant fraction of the lunar surface. Astrogeology has been working with NASA Ames, and ASU to convert as much of the Apollo mapping system data as possible into versatile digital map products. These products will enable a variety of scientific/engineering uses including mission planning, geologic mapping, geophysical process modelling, slope dependent correction of spectral data, and change detection. The paper detailing this work was published in The International Archives of the Photogrammetry, Remote Sensing and Spatial Information Sciences. Kenneth Edmundson, a photogrammetrist with Astrogeology, represented the co-authors at the symposium. Astrogeology Science Center, U.S. Geological Survey, Flagstaff, AZ: Brent A. Archinal, Jesse A. Mapel, Janet O. Richie, Makayla R. Shepherd, John R. Shinaman, Ethan D. Smith, and Lynn A. Weller. NASA Ames Research Center, Moffett Field, CA: Oleg Alexandrov and Ara V. Nefian. Lunar Planetary Laboratory, University of Arizona, Tucson, AZ: Kris J. Becker and Tammy L. Becker. Google Inc., Mountain View, CA: Zachary M. Moratto. School of Earth and Space Exploration and Space Exploration, Arizona State University, Tempe, AZ: Mark S. Robinson.